Alsace wines can either be fully dry or carry various levels of residual sugar. The "detection limit" for sugar is ca 4 gram/liter, but if the level of acidity is high (as in many Riesling wines) 10 gram/liter may pass unnoticed. However, regardless of sugar level, all wines from Alsace should be fresh, lively and balanced, never flat, heavy or dull. 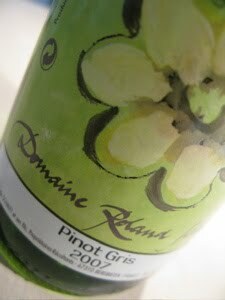 2007 Pinot Gris from Roland Schmitt in Bergbieten has an aroma, typical for the grape; orange marmalade, smoke and apricots. The taste is medium bodied with notes of rhubarb pie and pineapple, superior freshness, minerality and an almost dry finish. A lovely wine for the table that will gain complexity over several years. Price: € 7.00.